The Gilded Age, featuring new works by Aaron Horkey, Esao Andrews and João Ruas. A rarely exhibited graphic designer, illustrator and artist, Horkey creates intricately detailed hand-drawn silkscreens, highly coveted by collectors the world over. Immediately recognizable, his aesthetic has permeated print culture at large, and is one of the most distinctive in contemporary concert posters and album art. When approached by the gallery’s Director and asked to describe his ideal group exhibition, Horkey immediately suggested Esao Andrews and João Ruas as choice gallery companions. All three artists share an inexhaustible penchant for detail, a preference for all things ornate, and an antediluvian sensibility that tends towards allegory and myth. Enter The Gilded Age: the fortuitous result of a seemingly unlikely pet-project, and a rare and unprecedented opportunity for collectors, fans and enthusiasts to see these three illustrative giants wring life from inanimate sands. Aaron Horkey lives and works in his rural hometown of Windom, Minnesota. 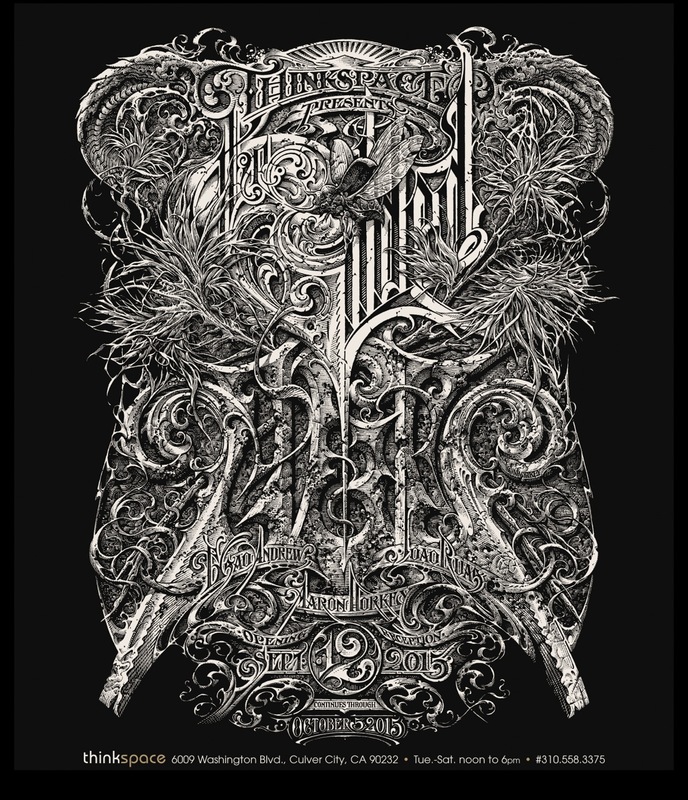 He is renown for the iconic animalia and exquisite hand-drawn typography he has created for heavy-weight bands like Isis, Converge, Boris, The Melvins and Neurosis, among many others. Horkey stands alone as an uncompromising talent, famously only producing his highly sought after commercial work in the absence of art direction. A tireless obsessive, his aesthetic conveys horror vacui, or the paradigmatic dread of emptiness shared by both the dense sculptural reliefs of the ancients and the ornamentation of late 19th century graphic design. Linear detail is worked and accumulated to a staggering degree in “a Horkey”, and the surfaces are often densely impenetrable with layers of decorative, organic motifs and animals of surreal mythological proportions. A visual storyteller, Horkey creates a post-apocalyptic, quasi-naturalism, Gothically stylized and yet reminiscent of the late 19th century’s penchant for beautiful design. His pieces, though clearly contemporary, reflect the primacy of craftsmanship and the love of ornament championed at the turn of the century. A time of economic growth, industry and expansion in America, the Gilded Age is characterized by an aesthetic return to the organic, ornate and man-made, but the era also betrayed a melancholic awareness of industry’s destructive supremacy, and feared a future dominion of the machine. This darker sensibility is consistently apparent throughout Horkey’s work; an artist always returning to the humbling power of the land as a theme, and to its momentums of survival and decay. Helmeted birds, airborne manta rays, prehistoric insects and winged buffalo, are but a few of Horkey’s recurring cast of characters. Evading a specific sense of time, history and place, the natural mythology Horkey has painstakingly crafted is markedly, and perhaps most tellingly, absent of humans. Esao Andrews is an illustrator and painter based out of Los Angeles. His oil paintings on panel blend figurative and organic elements into beautifully haunting and distorted dreamscapes. Often surreal, eroticized, and exaggerated to the point of the grotesque, his works have been compared to Mark Ryden’s predilection for thorough stylization, and John Currin’s contemporary figurative Mannerism. An illustrator who has produced work for DC comics, and album art for bands like Circa Survive, Andrews creates emotive narratives and allegories through the intuitive juxtaposition of imagery. Often combining human and natural worlds in a mashup of symbolic gestures, Andrews’ highly detailed works resonate with the ghosts of our sub-conscious. Like worlds unto themselves, at times bordering on nightmare, his paintings provide glimpses into alternate and parallel psychic universes, capturing moments of meditative solitude, quiet realization and melancholy. Brazilian artist João Ruas is similarly preoccupied with detailed stylization, narrative symbolism and the darkly emotive surreal. A consummate illustrator and designer from São Paulo, Brazil, and creator of Fables covers, Ruas combines ancient references with the contemporary, to create timeless visual mythologies. A gifted figurative artist, his works explore the universal themes of transition, power, strength, transformation and loss with an empathetic tenor. His haunting works are inspired by the age-old function of myth as an antiquated system of attributing meaning to natural and human chaos. Ruas’ beautifully executed lines, love of detail, and quasi-Gothic aesthetic, also recall the late 19th century golden age of illustration, and its propensity for lush hand-drawn worlds. Fascinated by the enigmatic mystery of lore and symbols, and drawn to the use of recurring contrasts, Ruas punctuates his work with a system of evasive signs. His pieces always tend to reveal the spectral traces of graphite in the end product, a choice that discloses both the presence of the artist and the ghostliness of his universe. The Gilded Age presents three exceptional artists – two of whom are hand-picked by the inimitable Horkey – whose respective work, though entirely unique and contemporary, recalls many of the sensibilities shared by the late 19th and early 20th century return to craftsmanship, narrative and ornamentation. Particularly relevant given our entrenchment in an age of digital reign and impermanent culture, The Gilded Age betrays a nostalgic yearning for the maximalism of the human hand.